The game was developed by Francisco Téllez de Meneses (Fran). We had already worked together on Unepic, a pretty successful metroidvania RPG published on Steam and consoles. V.O. A folder per character. -Around 200 Pro Tools folders. -386 unique audio files in the final game (not including voice overs). -Over 1000 lines of dialogue for each language (English, Spanish and Russian localizations were made). -Around 230 sound events covered in the game. 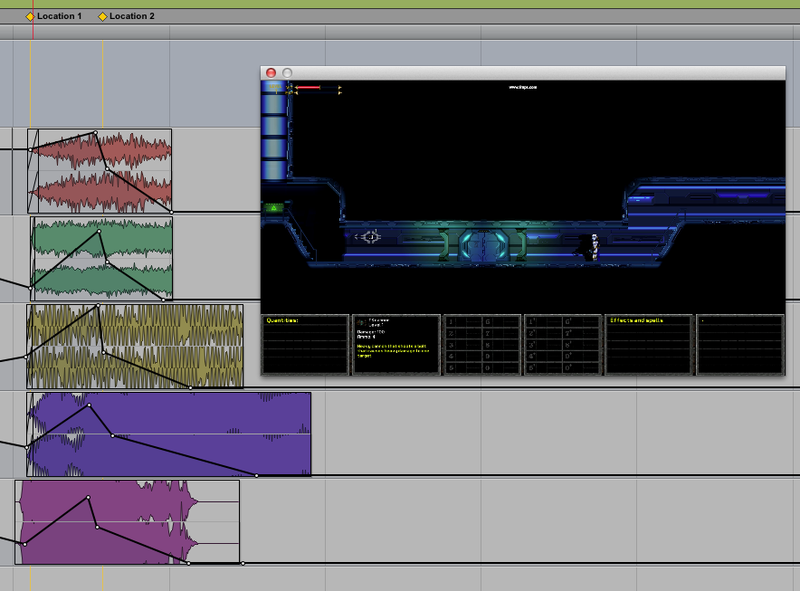 For this game, we were using the Unepic engine (written in C) which already manages audio using DirectSound. This API allows cross-platform audio and, in the case of Unepic, allowed us to port the game to the a big variety of systems including WiiU, Playstation 4, Xbox One, PC, Mac & Linux. Ghost 1.0 is also planned to be ported to some of these systems in the near future. DirectSound works nicely but sometimes I missed some middleware features like "live" layering, more complex randomization capabilities and better loop management. I realised that not using middleware forces me to really work on the SFX within Pro Tools and only bounce when everything seems perfect. Going back and forth between the game and the DAW is very common. On the other hand, with FMOD or Wwise, I often find myself just casually creating the SFX layers knowing that I can put them together and even EQ or compress them within the middleware environment. This difference in the workflow is something to keep in mind while switching between projects with or without middleware. I began by working on some general sounds to define the game's tone and style. Footsteps, the starting weapons and initial character skills were the very first things we focused on. The basic, primary blaster pistol was one of the SFX that went under the most iterations. It's the gun every player starts with so we wanted to make sure we had the right sound for it. Here you can have a listen at how the starting gun SFX evolved. At the beginning, we were just trying out different styles until settling with a more mechanical and simpler sound. Version 9.3 was the one used on the game. One of the main priorities creating this sound was to avoid being annoying through repetition. Sometimes you think you have a cool sound but you have to remember that, if the SFX needs to be played over and over again sometimes you are better off with a simpler, shorter SFX. Also, we made it feel a little weak with the idea of making the player feel powerful when switching to better weapons. The room where you start the game and try your primary weapon. I've been here too many hours. After this initial phase, Fran would then ask for new sound effects as the game grew and expanded over time. The nice thing about this way of working is that the project doesn't require constant attention but what it does require, is an ability to adapt quickly once again to the tone of the game when work does need to be done. In this way, it was a very organic process, usually without strict deadlines, that allowed us to spend the proper amount of time creating the right SFX. I used a spreadsheet, to gather every relevant piece of information including the name of the SFX, its duration, how it was triggered (one shot or loop), its location in the game, description and examples. This was crucial to be able to keep track of dozens of sound effects at the same time, I'd usually found myself constantly going back to the spreadsheet to note down ideas or check on things. Whenever the sound was going to be triggered by an animation and needed precise timing, I'd record a short video of the animation using OBS and then use it as a reference in Pro Tools. Any given SFX would need on average around 2-3 versions to be approved. Usually language is not very good to describe the abstract world of sound so I always tried to get as much information as possible (the spreadsheet is great for this) to get close to the idea Fran had in his mind. Weapons and power-ups are a good example of a SFX that can vary greatly in its style. Sometimes just knowing is a "Cloaking device SFX" is not enough information to get the SFX right. Should it feel powerful? Quiet? Electric? High Tech? Is there an example from other game or movie? Making these kind of questions is crucial. I always took extensive notes through meetings, or, even better, recorded the whole thing. Having all the information and context for a given SFX in a video that you can go back to was a blessing. I never trust my memory and you probably shouldn't either. I had a separated Pro Tools session per sound effect and usually even separated sessions per version of a given SFX. It would often happen that I had to go back to a previous version or combine layers from some of them so giving every version its own session is the safest way to go about this in my opinion. For version control, I keep a very simple but effective system. I would use the sufix "_v1", "_v2", "_v3", etc. at the end of a sound file name. I recommend this system or a similar one and I'd avoid using terms like "_final" or "_last" because you never know when you are going to need to go back and change something, even months later. A sequential numeric system keeps everything tidy and clear. I would sometimes use sub versions like "_2.1" or "_2.2" when the sound design was essentially the same but there was a small difference in volume or EQ, usually to make the sound sit better in its context. 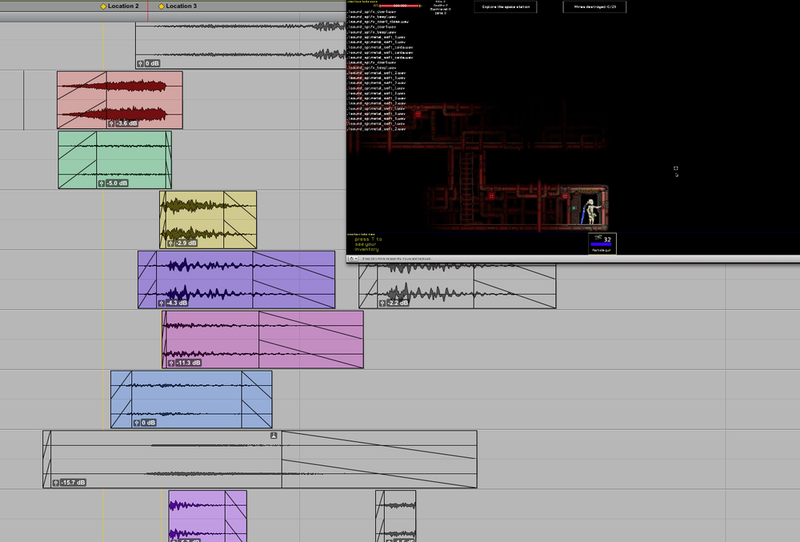 Basically, testing new sounds was as easy as swapping the audio files in the game folders. To make work easier, I had access to a developer copy of the game that allowed me to have instant access to the whole map and to cheats like being invincible or give myself any weapon or power-up. Having access to these kind of tools is key to speed up work and helped me a lot to focus on the sound design and testing SFX. I first worked on Ghost 1.0 using a Mac mini to do the sound design an run Pro Tools. I used bootcamp partition with Windows to run the game. I also had the option of emulating Windows but when working with a game still in development things can be unstable sometimes so running the game on Windows natively was the most reliable option. Going back and forth between two operating systems is quite slow and usually breaks your creative momentum when working and testing new sounds in the game. So I later upgraded to a dual computer system. I still use my Mac mini as a Pro Tools and Soundly machine and then I custom built a PC to run the games I'm working on. I share files between both computers via Ethernet and the keyboard and mouse using Synergy's Seamless which sometimes can be a little problematic, especially if you are using an old mac OS version, but in general, I would recommend this set up. A comparison between Unepic and Ghost 1.0. Both have a similar point of view. Both Unepic and Ghost 1.0 use a classic metroid style 2D Side-scrolling view that is particularly wide so our hero looks pretty small on the screen. This presented some challenges in the stereo sound placement and also in terms of getting the distance right. If we use a completely realistic approach, with the listener on the camera, all sounds should be pretty much mono and somewhat far away but of course, this would be quite dull, since we wanted to convey information about enemy placement using the stereo field. So, what we did was to imagine that the listener was somewhere between the camera and the character. This way, we have some stereo depth but keeping also a sonic perspective that works with a wide camera angle where you can see several enemies and platforms at the same time. We used baked-in reverbs since all the action happens in a very similar environment, the space station hallways and chambers. I may have used bigger reverbs for certain SFX that only play in large rooms, like boss rooms. I leave you with some weapon, User Interface and environment sounds from the game. If you have any questions or want me to expand on anything further, feel free to leave a comment.